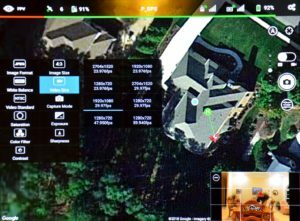 When you set up your aerial drone camera to take videos, the first thing you’ll want to do is to select the American standard of NTSC (National Television System Committee). Your other option is PAL (Phase Alternation by Line), which is more common in Europe, Asia, and Africa. A third standard known as SECAM is also common in Asia and Africa, and your drone may offer it as well. When in the USA, select NTSC. The main difference is frame rate where the American standard is based on 60 Hz and the European standard is based on 50 Hz. Among your camera’s setting options, you’ll find video size, which allows you to select format and framerate. You can select from 4k for the UHD or Ultimate High Definition (think of Sony’s 4k digital cinema in your movie theater), 2.7k and 1080p (also known as FHD or Full High Definition), and 720p (also known as HD or High Definition). I recommend setting your video to 1080p, which has a frame resolution of 1920×1080 pixels, and is standard among televisions and computers. Unless you have a requirement to use higher resolution, then 1080p is the standard for you. Higher resolutions, such as 2702×1520 and 4096×2160 are gorgeous if you have the hardware to play them. Their downside is the increased amount of time required to render in video editing software. Another downside is stutter when playing them on less than state-of-the-art hardware. Recently I compared several of the UHD and FHD video formats and found that my computer monitor displayed all of them, but stuttered when the source was 2.7k or higher. I couldn’t tell any difference in their resolution when compared with standard 1080p, but that would be expected with a 1080p monitor. There was also some stutter when I played a 1080p video at 60 frames per second. For most videography applications, I recommend using 1080p at 30 frames per second. Eventually the market will move to 2.7k and 4k resolutions, so you should be ready to switch when that time comes. Common formats for aerial drone cameras include 12MP (4000×3000 pixels) and 20MP (5280×3956 pixels), which are sufficient resolution for super fine-grain pictures. I have found that the resolution of the sensor is typically greater than the limitation placed on it by the camera’s optics. Check it out for yourself by blowing up an image in your favorite photo viewing software. You’ll see the image is blurred from pixel to pixel, which was caused by the optics, not the sensor. This is why you want the most direct path for light to enter the image sensor. Due to their small size, these cameras (and their filters) pick up finger prints and smudges that will reduce the resolution of your camera. Inexpensive filters are another contributor to lower resolution. Three-byte color granularity is known as 24-bit color because there are 8 bits per primary color. It’s also known as “True Color” or “16.8 million colors” since 2 raised to the 24th power is 16.8 million. 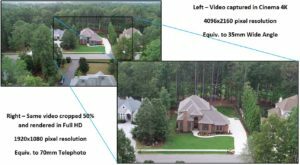 Using our drone’s 12MP image as an example, the resulting image file is 36 million bytes (or 34MB). Fortunately, cameras compress the images and reduce their file size to perhaps a tenth of their original size. You’re probably already familiar with the common file compression standard created by the Joint Photographic Experts Group and known as JPG. A drawback of the JPG compression standard is that certain pixels are selectively thrown out. The loss in fidelity is usually negligible. However, the compression process is not reversible so some image quality is permanently lost. For optimum results, professionals use the camera’s raw mode, which compresses image files without throwing out any pixels. The resulting file sizes are 2-3 times the size of a JPG file, but there’s no sacrifice in image quality. DJI’s aerial drone camera options list RAW, but download in Adobe’s Digital Negative (DNG) format. For most photography applications, I recommend using the JPG format due to its high popularity. For those special shots (or client requirements) then select raw mode. Settings for exposure value, contrast, saturation, color filter, etc. are also available for the experienced photographer. Default values will usually suffice for the casual photographer, but when you’re looking for more control you’ll find it under these settings. Balanced propellers will reduce the vibrations that transfer to your flying camera as these small movements can result in blurred stills and shaky video. How Can I Improve the Quality of My Drone’s Photography? Drone manufacturers have fairly good quality control for their airframes but like any airborne device their smoothness depends on proper balancing of the rotating components. In our case, that would be the propellers. We’ll assume for the moment that the motors and propellers are running true and aerodynamically balanced. More on that below. First, Why Should the Propellers be Balanced? Well, why do drivers balance the tires on their cars? Experienced drivers know that unbalanced tires lead to vehicle vibrations when their speed picks up. The same holds true for drone propellers. When one part of the propeller is heavier, the spinning mass delta will cause vibration that increases with speed. To balance the propellers, you’ll need to purchase a balancing kit; example in the picture above. 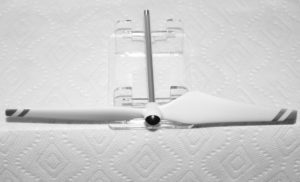 It works by attaching a rod to the propeller and the pair is then balanced on a very low friction support. Any propeller imbalance will cause the propeller to roll until the heaviest part of it hangs below. Balance is achieved by adding or removing material until the propeller is stable. Place the propeller so it’s horizontal and watch for one side or the other to dip. Then sand/scrape off a small amount of material from the heavier blade such as on the bottom side near the tip. (Or add a little scotch tape to the lighter blade.) Horizontal balancing will take out most of the vibration. Vertical balancing is next. The concept here is that whatever imbalance that remains is in the hub. Place the propeller so it’s vertical and look for motion. Balance is again achieved by adding or removing material until the propeller is stable, but this time it’s at the hub. If needed, sand/scrape material from the heavy side of the hub, between the propeller blades. This step may take longer because more material typically needs to be removed. Your propeller is properly balanced when it remains stationary on the support no matter which position the blades are placed. How Do I Ensure the Propellers are Running True? Great question and easily answered! Start your drone on an elevated surface, such as a table, but don’t take off. Then observe the blade tips, looking for spread. There will be little to no spread if the blades are running true, which means they’re aerodynamically balanced. If there’s spread between the tips, then the blades have different amounts of lift or the motor/shaft are bent. This means that your propeller is aerodynamically unbalanced, causing vibration. Typically, the culprit will be just one of the propellers so you can rule out a bent motor by swapping the propellers (e.g. exchanging one black hub propeller with the other). If whatever spread you saw on the one side does the same thing on the other, then the propeller is bad. Balanced propellers will lead to the smoothest possible photography with your drone. Whatever residual vibration that appears in your video can be taken out with post-processing software. Video production and post-processing are where the video and photo clips are assembled into a composite video. This is where the art of taking pictures meets the art of developing a deliverable product that meets the expectations of the client. What is typically done in Video Production and Post-Processing? Videos, photos, voice, and music components are planned and then sequenced into the software’s timeline. Each component has a time associated with it, so the sequence is planned from beginning to end with a target run length. For a specific run length, video segments are cut to the desired length and photos added/removed for a pleasant balance. Post-Processing is challenging, but is key to achieving great results. In addition to assembling the components, there are special effects that include cropping, adding motion to photographs, reducing shake and vibration, adjusting brightness, contrast, color density, etc. Sometimes, a voice or music track is not needed, but other times they’re critical to finish that perfect video. Once the video has been assembled, it is rendered – or processed into the feature video. Rendering is processor-intensive and can take as long as several times the finished run length. As you know, aerial drones don’t record audio. For many productions, this is OK because the finished video doesn’t require a sound track. For example, the business person is in an open office space where the audio can be distracting to others. A target audience like this is looking for information – and subtitles will suffice. There are other productions where a sound track is preferred and, fortunately, video mastering software makes adding a sound track relatively easy. The hard part is getting the audio track, whether it’s the client’s voice recording or a specific music request. You’ll want to work closely with the client at this stage as the process works best when he/she understands what is needed and provides the voice and music files. In my experience, manipulating the visual media is the easy part. Sound, on the other hand, can run into multiple iterations with each requiring another rendering and submittal for approval. Visit our Portfolio page for examples of the different types of sound tracks. Should I be concerned about Copyrighted Material? We must respect copyrighted material, whether it’s video or audio. So, although it may be easy to copy a track from our favorite CD/DVD, there’s also the risk of getting discovered and forced to pay. Detection methods are now being used to track unlicensed usage of media, and copyright owners love to demand outrageous prices when someone gets caught. It’s always best to purchase the license and have a clear conscience. I could spend a lot more time on copyrighted media, with some horror stories to go along with it. For now, let’s stop here and I’ll follow up later with a more detailed blog. 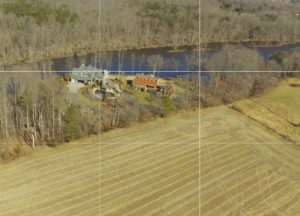 Here are some tips on how a little trigonometry can help you to improve your drone shoots. 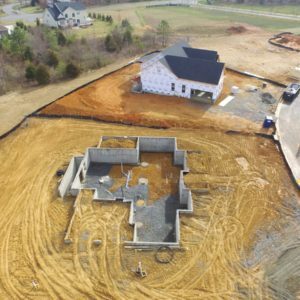 Most Virginia drone pilots can fly to a position that “looks right” in their display for taking photos and videos, but what about those large jobs, such as a hundred-acre tract of property? I recently had a commercial session involving the marketing of 116 acres of undeveloped land. My usual preplanning (and pre-programming the aircraft) was a little more challenging because I wanted to fly at the right altitude, the right speed, and the right camera tilt in order to minimize the “trial and error” approach to videography. I’ll be happy to talk off-line about the actual formulas, but to keep this post as brief as possible I’ll just outline the principles. The fundamental information you’ll need is your camera’s field of view (FOV) and the frame’s aspect ratio. For example, the DJI Phantom drone’s FOV is 94 degrees and its aspect ratio is 4:3 for photos, and 16:9 for videos. For 4:3 photos, the trig results are approximately 75 deg horizontal FOV and 56 deg vertical FOV. (Approximate because this is a two-dimensional approximation of a 3-D device.) These results are shown graphically in the figure above. For 16:9 videos, the horizontal FOV is about 7 deg wider (82 deg), and the vertical FOV is about 10 deg narrower (46 deg). With this information, you can calculate the field of view for any given distance. Say you’re shooting a photo straight down from an altitude of 100 feet. 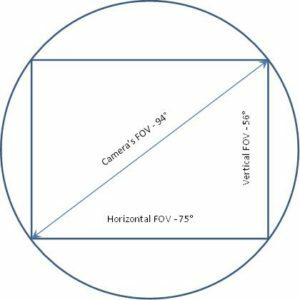 Using the sine and cosine functions, the horizontal FOV is 122 ft and the vertical FOV is 95 ft – or – a rectangle 122 x 95 ft. This is suitable if your subject, say a house, is around 60 ft wide. This ratio stays the same, so at a distance of 200 ft, the rectangle scales up to 244 x 190 ft.
Another useful angle is the tilt required to put the top of the frame just below the horizon. We found out above that the vertical FOV is 56 deg. With the camera’s tilt at 0 deg, the horizon is centered in the view. Therefore, the top and bottom of the view are at 0 deg plus/minus 28 deg. So, in theory a camera tilt of -28 deg should put the horizon at the top edge of the camera’s view. For 16:9 video, the horizon (again in theory) is at about -23 deg. In practice, I use a tilt of -30 deg for photos and -26 deg for videos to ensure landscape pictures aren’t turned into silhouettes by the bright sky. Another tip: Use algebra to solve the time required to run a certain distance at a given speed. This will help you determine how much air time will be required per run and, thus, how many batteries to bring. These concepts are approximate and you may come up with different results. Regardless, a reasonably disciplined approach will help you plan your flying sessions. Today we’ll touch on scene composition and grid lines. Digital cameras often have a feature that adds grid lines to the viewfinder. The DJI Go application also has this feature, which is turned on within its camera settings menu on your mobile device. Grid lines are a useful tool – they appear on your mobile display but they won’t appear on the actual photos and videos that you take. Grid lines will help you compose your photos and videos by reminding you to check the horizon and land features so they square up in the frame. It can be a real letdown to take the perfect shot and then find it slanted by a few degrees. If you’ve added a filter to the camera lens, you may find the added weight causes the horizon to tilt a little to the left or right. This is easily fixed by doing a gimbal calibration. Just make sure the aircraft is on a level surface so the horizon will be level in your display. Formal photographs are often taken with the subject centered, but for most other photography the image is more interesting if the subject is placed off-center. We recommend placing the subject approximately 1/3 from the edge of the frame and facing towards the center. Another useful application for grid lines is for setting up pre-programmed function runs, such as way points. The menu blocks part of the camera view, but with grid lines you can see the center point of the camera’s view. Try grid lines the next time you’re out flying your drone. Too dark? Too light? Color is off? Whether your drone is using automatic or manual exposure, you’ll almost always have to use post-processing to get the right brightness, contrast, and color saturation. Setting EV to zero and using the histogram is great, but backlighting from the sun and bright horizons will turn the best landscape photos and videos into silhouettes. No worries though; most of your under- or over-exposed photos can be corrected in post-processing. There are a number of commercial software applications on the market that will assist you with this. Choose one and get familiar with exposure compensation. The results will be well worth the effort. A simple but effective application known as Microsoft Picture Manager comes bundled with their Office Suite. Even for extreme cases of under/over exposure, adjustment will enable you to salvage images you thought were destined for the recycle bin. 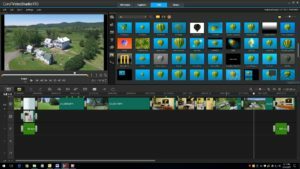 I like Picture Manager and Windows 10’s Movie Maker because they’re intuitive, quick and efficient. For our commercial editing, we like Adobe’s Photoshop Elements for stills and Corel’s VideoStudio X10 for videos, but the same principles can be put to work with the more basic (but effective) Microsoft products. Drone pilots, you already know that the best picture is the one that won’t take much post-processing. I’ve found that you can get great results letting the drone’s camera take stills using Automatic Exposure (AE) and tapping the screen where you want the exposure to be measured. The only lens filter that you should use is an ultra-violet haze (uv haze). For videos that pop, the golden rule is to film with a shutter speed of at least double the frame rate. So, if you’re recording video at 30 frames per second, your shutter speed should be 1/60th of a second, or faster. ISO should also be low, in the range of 100 to 200. Look for an EV value near zero. You can achieve the above video settings automatically or manually, but for drone cameras with a fixed F/stop you’ll need to use neutral density (ND) filters. Choose a filter, say ND4 or ND8, depending on how bright it is. I prefer AE for video as well, and use the ND filter that gets my drone’s camera closest to the above settings. It’s a good day when your stills and videos come out perfect. The rest of the time (read most of the time) count on using photo and video editing software to get optimal results. Aerial drone pilots have on occasion set up for a flight only to find that their drone won’t start up. This can happen, for example, in Northern Virginia where your intended flying site is within the 15-mile “inner ring” of the Flight Restricted Zone (FRZ) that surrounds Washington, DC. This ring covers a lot of area and has caught more than a few drone pilots off guard. The problem is in the drone’s software, which prevents the propellers from starting whenever its GPS tells the drone that it’s within one of these zones. Manufacturers of these sophisticated drones are required to include the FRZ’s in their software. If you start up outside, but then try to fly into it, the drone will stop at the invisible barrier and skirt the boundary. Although intended to protect the air space around our nation’s capital, this zone extends well into Northern Virginia and Central Maryland. For example, if you’re in Lorton, Fairfax, Oakton, or Vienna you’re either within or very near the edge of the DC Flight Restricted Zone. In General, Where Will I Find No-Fly Zones? 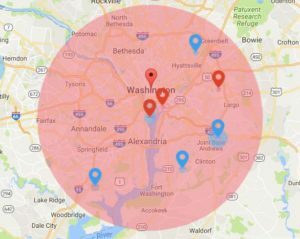 Are there other No-Fly Zones that drone pilots are required to avoid? There are many, notably airports and heliports where drone operations are not allowed within 5 miles without permission from the Air Traffic Controller. Others include most U.S. National Parks, special events, and political events. How about government buildings, nuclear power plants, and prisons? 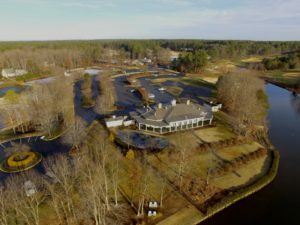 The FAA and other regulatory agencies are working on flight rules and the wise drone pilot will avoid flying around these sites without specific permission. Where Can I Safely Fly My Aerial Drone? That brings us to the safe areas where drone pilots CAN fly. FAA-certified drone pilots are trained to read aeronautical charts and to understand the air space in which they can operate. Air space classified as A through E includes airports and the air space in which most aircraft operate. Without specific ATC permission, they’re off limits. Everything else is Class G – uncontrolled air space, which is where most small drones will operate. Fortunately, Class G air space extends from the surface to the overlying aircraft air space, which includes just about any terrain the drone pilot typically needs to fly. Here, the FAA allows drone operations at altitudes up to 400 feet above ground level. In the vicinity of tall structures, drones can operate higher than 400 feet (your drone may be firmware-limited to 1640 ft) but must stay within 400 feet of the structure.